Residence Inn by Marriott Loveland calls all family and friends of Spring 2016 Colorado State University graduates to Fort Collins this May. Commencement ceremonies begin Friday, May 13th and last throughout the weekend. Family and friends are encouraged to avoid the Fort Collins traffic and stay close by in Loveland. Guests may enjoy extending their weekend festivities and visiting nearby Rocky Mountain National Park or explore more of Loveland’s attractions, including Devil’s Backbone Nature Trail and Benson Park Sculpture Garden. For more information about Commencement ceremonies, please visit http://www.commencement.colostate.edu. Residence Inn by Marriott Loveland is an ideal home-away-from-home for business and leisure guests with comfortable guestrooms, great amenities and a convenient location for travelers. All guestrooms include HDTV, fully-equipped kitchen, comfortable bed and much more. Accessible guestrooms are available upon request. Hotel amenities feature: free hot buffet breakfast daily, complimentary Wi-Fi, on-site laundry, outdoor sports court, indoor pool and much more. Residence Inn by Marriott Loveland is located near I-25 and 20 minutes from Colorado State University Campus. For reservations and more information on the Residence Inn by Marriott Loveland hotel, please visit http://www.residenceinnloveland.com or call (970) 622-7000. 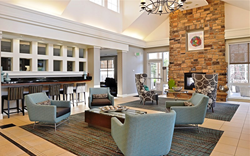 The Residence Inn by Marriott Loveland is proudly managed by Stonebridge Companies in Denver, Colo.